With a nod to the backwater regions of Southwest Florida, Alligator Bay Distillers is a family-run operation producing a line of boutique rum products from their production facility in Punta Gorda, Florida. Alex Voss grew up in Naples, a small town south of Fort Myers. In 2012, he moved to Maui, Hawaii where he learned to make rum. He started as an apprentice and worked his way up to distiller at Haleakalā Distillers. Returning to Naples, Alex brought home his knowledge of cane spirit production, collaborating with family members to launch their own facility in 2015. While Alex concentrates on rum production, brother Ben Voss leads the marketing efforts and serves as chief mechanic at Alligator Bay Distillers. We arrived on a Saturday afternoon for a look around and a tour of the facility. Alex welcomed us and spoke of his process and philosophy of making rum at Alligator Bay Distillers. Starting with molasses from Clewiston — the legendary sugar town near Lake Okeechobee — Alex has perfected his fermentation process with an ideal active dry yeast strain that thrives in the warm humid climate of Southwest Florida. The fermentation process takes seven days and produces a rum mash with an alcohol content of 8%. The distillation process involves double distillation in a traditional copper pot still to 70% abv, retaining much of the molasses and cane flavors in his distillate. The aging room is completely filled with resting oak barrels. The aroma of rum and wood is enticing — and certainly whets the appetite for the next stop on the tour — the tasting room. Indeed, the clear rum retains a true flavor of cane and serves as the base for the spiced rum. The Sun Gold rum is lightly aged and the addition of Black Mangrove honey offers a nice finish. The Saba Treasure offers a subtle hint of fennel. The rum that brings home the most awards is the chocolate-infused Dark Rum. This boutique specialty took home a gold award in the 2017 RumXP international tasting competition at Rum Renaissance Festival. With a motto of “cane to bottle,” the small batch rums made by Alex Voss at Alligator Bay Distillers are distinguished by his artisan hands-on approach to production. The distillery is open for tours Monday through Saturday from 11am to 3pm, starting on top of the hour, at 25522 E Marion Ave. Punta Gorda FL, 33950. A rich planter’s style dark rum, Naked In Jamaica is a private label spirit produced by famed flying ace, aerobatics champion and vintage airplane collector Kermit Weeks. The rum was created to his own specifications by Florida Caribbean Distillers in Winter Haven, Florida. Naked In Jamaica dark rum is inspired by a song of the same name depicting a lifestyle of casual enjoyment in the tropical setting of Negril. Kermit sees clothing as a metaphor depicting the sublimation of one’s true self potential. He hopes the rum might inspire friends to strip the perceived inhibitions, false pretenses and limitations on finding their true self. 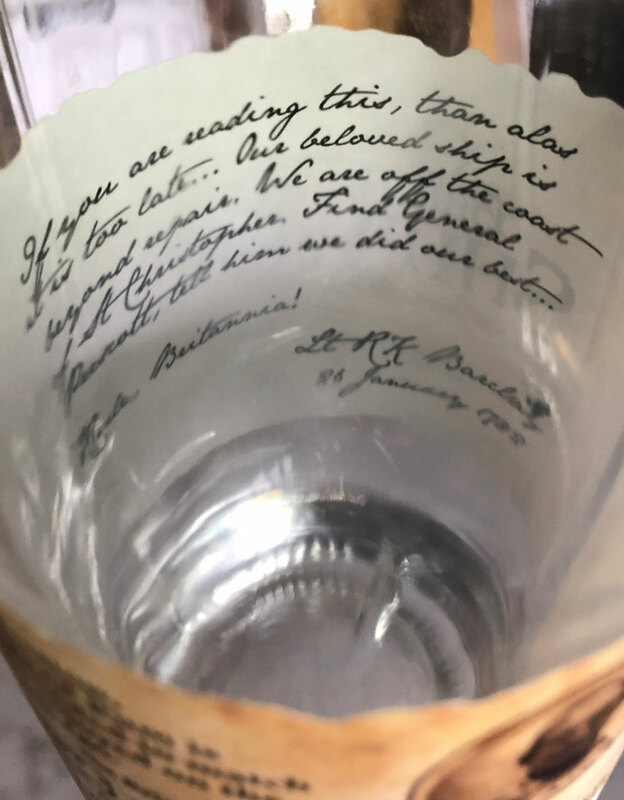 A noble message in a bottle. Aromas of rich molasses and brown butter dominate the nose, before a suggestion of vanilla, cinnamon bun, toasted coconut and dark fruit. On the palate, initial notes of sweet caramel, butterscotch and vanilla butter cream precede prune wine, chocolate brownie and treacle with just a hint of oak. The finish fades slowly with echoes of sweet coconut, then bitter chocolate over buttery croissant. Naked In Jamaica dark rum strives to rekindle old-fashioned tropical essences used to make classic cocktails such as Planter’s Punch. It’s a good base ingredient for tropical punch recipes and makes a fine dark floater on top of tiki cocktails. The rum includes a warning to please drink responsibly and use sunscreen. Naked In Jamaica took home a gold award in the Boutique Dark Rum category at the RumXP Tasting Competition at Rum Renaissance Festival, as well as a gold award from the Consumer Rum Jury. The 750ml plastic bottle of Naked In Jamaica dark rum at 80 proof sells for about $19. Kermit Weeks is an American aviation enthusiast, pilot, and aircraft collector. He has competed in aerobatics, designed aircraft, and is well known for promoting aviation and the restoration of vintage aircraft. Kermit Weeks operates Fantasy of Flight, one-of-a-kind aerial attraction and mega-event space in Central Florida that blends Old Hollywood glamour with modern elegance. The property houses his substantial vintage aircraft collection at his private airport. Florida Caribbean (originally Florida Fruit Distillers) quietly produces 10 million proof gallons each year of wine, beer and spirits, mostly bulk rum sales and industrial alcohol. The state’s first registered distillery opened in 1943 making neutral spirit with molasses from Florida Citrus producers. An unconventional product by any standard, Stroh 160 Overproof Rum is a unique spiced and flavored rum liqueur from Austria that defies categorization. Like Germany’s Rum Verschnitt, it’s made of neutral grain distillate, loaded with strong essences and rich rum flavors. In Germany and Scandinavia, the traditional holiday comfort flavor profile makes it a favorite for celebrations, but you rarely see it used to make cocktails — or be forewarned — enjoyed straight. Every rum has a purpose. At 80% abv, Stroh 160 delivers a robust and potent spirit popularly used as a key ingredient in festive punch recipes, representing warmth, friendliness and good cheer. It’s also mixed with black tea to create a traditional warm Jagertee libation popular for after-ski festivities in Europe. Stroh 160 is used to flambé table-side dishes, but perhaps it’s most popular use is for home baking, like old-fashioned holiday fruit cake. The rum’s secret recipe was first developed in 1832 by Sebastian Stroh. Like Jägermeister, this “inlander rum” is sometimes perceived as a powerful manly elixir representing a wistful bygone era of old European spirit making. In a Scandinavian hunter’s cabin deep in the frozen woods, a shot of Stroh 160 might seem appropriate to provide a warm invigorating experience, but otherwise, it’s not advisable to attempt drinking it straight. The bold crimson vermillion color first gets your attention. Aromas of pound cake, butterscotch, assorted fruit jelly and baking spices belie its overproof nature. On the palate, an initial hint of cotton candy precedes a big explosion of overwhelming fruit flavors and high ester funk before the base of creamy butterscotch, vanilla, treacle and baking spices endure into the very long finish. In Europe, this product is known as Stroh 80, referring to the 80% alcohol by volume overproof rating. In the USA, the same rum is named Stroh 160 to underscore its 160 proof content. In simple terms, there is twice as much alcohol in this bottle than your average 80 proof rum, so a little bit goes a long way. Among tiki enthusiasts, Stroh 160 has earned a reputation as a welcome component in Polynesian-style cocktails and topical libations that integrate a strong overproof rum into the recipe. The 750ml bottle of Stroh 160 overproof rum sells for about $35.